A selection of kettle tippers to help make pouring your favourite cuppa much easier! Whether you have a cordless kettle or jug kettle these kettle tippers will make things much easier when making your favourite hot drink. 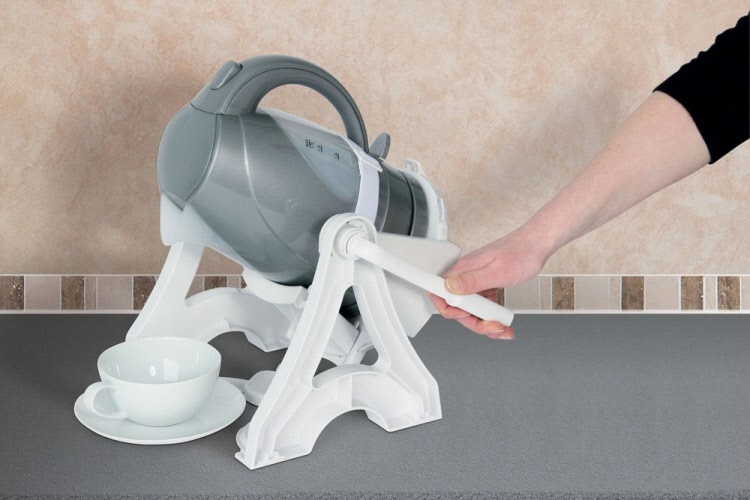 With only the need of one hand these kettle tippers are ideal for those who suffer from poor grip or strength. 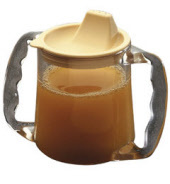 A coated wire cradle that holds most styles of jug kettle, and pivots on a raised wire frame by gentle pressure on the handle to assist with pouring. The kettle sits in the cradle and is secured by an elasticated strap. The frame has a built-in stop for positioning the mug and a back stop to prevent spillage if the kettle is accidently released during pouring. 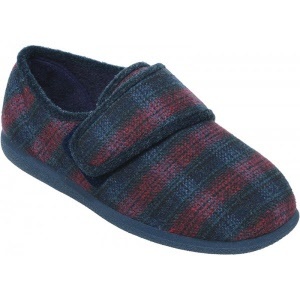 The frame has non-slip feet. ( Not suitable for cordless or mini jug kettles ). 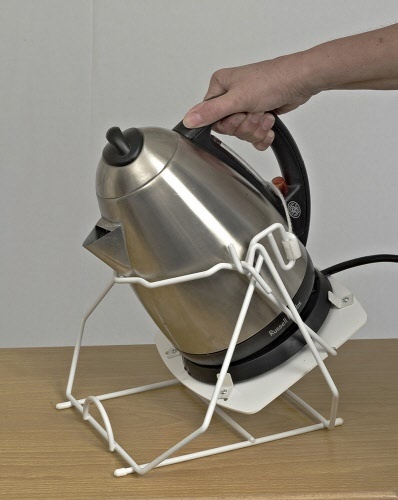 Specifically designed for use with cordless kettles, with a hook and loop strap and base clamps to hold kettle in place. Kettle not included. This new and innovative kettle tipper has been designed to reduce the effort and potential strain on the wrist that can occur when holding a kettle. The kettle is placed on the base plate of the tipper and secured into the most suitable position by a sliding stop and two sturdy straps. 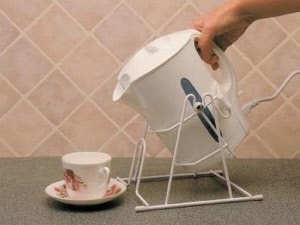 The lever, which can be positioned on either side, is then used to easily tip the kettle without the user actually having to lift or take the weight of the kettle to pour the water. For added safety the kettle will rock back into the upright position if the user lets go during use. The Kettle Tipper has been manufactured from heat resistant plastic for durability and its rubber feet prevent it from sliding on the work surface. Base Plate (Diameter): 200mm (7¾"). This is ideal for anyone who finds it difficult to grip a tray in a conventional way which can put a lot of pressure on the fingers. 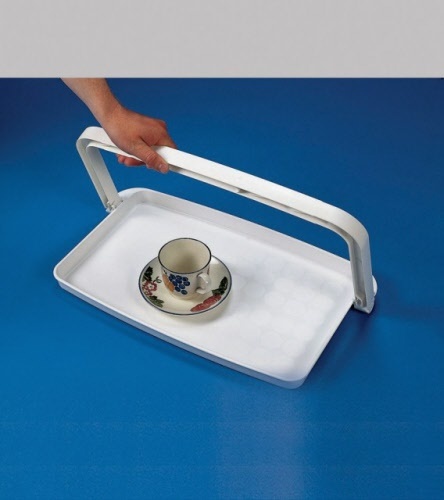 Instead users can carry the tray with their entire hand. This offers a much better grip and also increased confidence for the user. 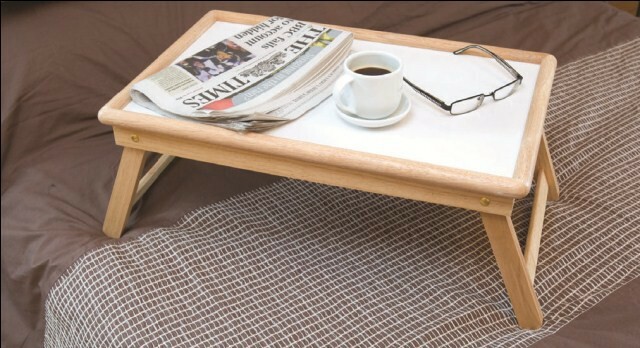 The tray is also an excellent solution for anyone who uses a walking stick or needs to hold onto furniture with one hand when indoors. A versatile tray with a variety of uses. 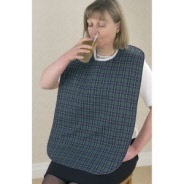 The legs fold out so that it sits over your lap in a bed or chair, and then fold away again after use for easy storage. The top of the tray can be used flat for eating or drinking, or can be tilted to a 45° angle, making it suitable for reading, writing, crosswords etc. Finished in an attractive light wood it will easily blend in with other similarly coloured items of furniture. The tray benefits from a laminated surface which is easy to clean with normal household cleaning products. Length: 555mm (22"). Width: 350mm (14").